When Florida ran into Michigan in the NCAA Tournament’s Round Of 32 it was clear the Gators struggled to score putting up only 49 points. When you have a lackluster offensive performance like that a question always arises—were you just missing shots and that’s why you didn’t score or were the quality of shots simply not good enough? With this being the last game of Florida’s season I thought it was finally the time for me to do something I’ve wanted to do all season but couldn’t because of the time commitment—chart out every single shot and by using expected shot value see if Florida actually was just missing shots they should have made or if the quality of shots just wasn’t that high. What Defines A Good Or A Bad Shot? A problem I think people get into when looking at whether or not a shot is good or bad is by letting the result influence your decision. In my mind, a good shot is a good shot even if the ball spills out and a bad shot is a bad shot even if it finds a way into the bucket. In the short term it’s easy to look at whether or not points were put on the board to indicate whether a shot was good or bad but in the long term the average value of those shots is going to come out and a player or a team in the habit of taking bad shots is ultimately going to see the inefficiency. Shot value is an outstanding way of gauging the quality of a shot and it’s something I think is really important. What is expected shot value? The expect shot value for that possession would be 1.5, and that is a tremendous shot. Now let’s say player Y gets a bit trigger-happy and takes a long, contested 2-point jump shot. Let’s say he’s shooting 39% on that difficult shot. That would be a bad shot. 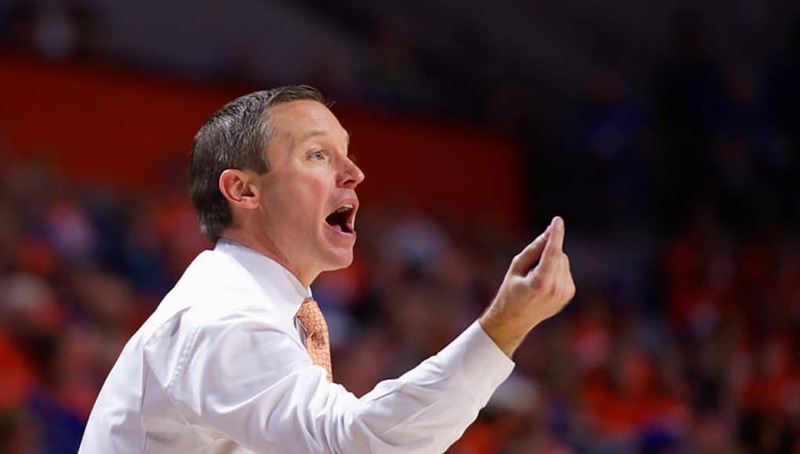 When you look at the numbers I’m going to be laying out for the Gators you can keep in mind that Florida averaged 0.9 points per possession this season which isn’t great but we know the Gators weren’t great offensively this season. However, that average point per possession number helps when we look at the shots the Gators took against Michigan knowing the if it’s around or above 1.0 it’s a good shot and if it’s below 0.9 it’s a bad shot. Using Synergy’s shot charts and play breakdown data I was able to get extremely accurate numbers for any available shot the Gators took. This was I did. First, I would see where the shot came from and log what kind of shot it was. Following that, I would adjust for whether or not it was a guarded shot or not (this makes a big difference in player percentages). Then, I would adjust for whether the shot was off the dribble or not (this makes an even bigger difference). When making the spreadsheet I accidentally forgot to show you if the shot was off the dribble or not but I definitely factored it into the equation, so just know that I am adjusting for that. Once I got the location of the shot, what kind of shot it was, if it was guarded, and if it was off the dribble or not, I could pull up each player’s stats from this season on that exact shot from that side of the floor to see what percentage they were shooting. From that percentage I could then do the simple equation of seeing what the expected shot value was. On a few possessions I made minor tweaks when a player was SUPER contested or SUPER open, but generally the data was good enough to get an accurate percentage for every shot. Here’s example from the Florida-Michigan game, actually a shot we saw multiple times in this game. Jalen Hudson. 3-point shot, right 45, guarded, catch and shoot (no dribble). I input all those data points into the Synergy analytics tool and it tells me he shot 35.3% on those exact shots these season on a decent sample size. And that is the expected shot value of that attempt! Make sense? I hope so. It would have been tough for you to see all these numbers in an image so I thought I’d keep it to a Google Sheet you’ll have to open in a new window. I definitely think it’s worth taking a look and worth looking at some of the various shots to see the percentages and the values associated with them. Without further ado, here is the expected shot value for every shot Florida took against Michigan. Finishing with 11 points on 15 shots it probably looked like Hudson was having a tough night shooting and shots just weren’t falling but really the expected value of his total shots was 12.048 points. He simply just took a lot of shots that were of low value to the Gators. Now that isn’t just to pick on Jalen Hudson as KeVaughn Allen, Noah Locke, and others took shots of low value to the team, and that is a microcosm of the entire season. 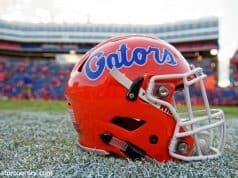 I don’t think Florida had good shot selection all season long and it really hurt the offense. 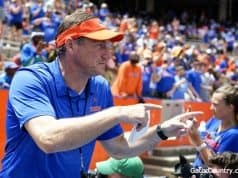 Moving forward the Gators need to learn to value possessions better by taking better quality shots and the analytics are a tremendous way to find out what a good shot is and isn’t. For example, we saw 46 threes off the dribble from Hudson this year. He shot 19.6% on those shots. 3 x 0.196 = 0.588 points per possession. 3 x 0.143 = 0.429 points per possession. Noah Locke shot 23% from 7-12 feet, largely on floaters and tough turnaround jumpers. These are all extremely low-efficiency shots and while I pointed out some of the bad shots a few players took, I could have picked a lot of shots from a lot of players. I’m not sure if it’s just a matter of better educating players on what a good shot is or isn’t or whether the coaching staff needs to look a bit more at things like expected shot value but the Michigan game shows just where Florida’s shot selection was at this season. Michigan is an elite, elite defense and that should be kept in mind when looking at how the Gators’ struggled but a lot of the shots Florida took were the same shots they’ve been taking all season and remember, I was using the player’s stats on the identical shots from the identical place from all season long so the percentages had been established long before the Gators played Michigan. 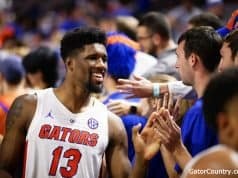 Shot selection is something I think matters a ton, as you probably know by now, and if the Gators are going to be an improved offensive team next year they’ll need to learn to value good shots and do away with the bad ones. There is also a defensive element of this as well. By looking at what shots are least efficient and have the least expected shot value you can formulate your defense around what shots you want to try to take away and what shots you can live with. What’s interesting to me is that on the defensive end Florida does a tremendous job of taking away the shots with the highest expected value, instead forcing contested 2s off the dribble. You can tell they know what shots they want to take away on the defensive end, yet they turn around and take those shots themselves on the offensive end. There is a lot more to the game of basketball than just the numbers but I think expected shot value has a ton of value and it’s something every team should use in every game.